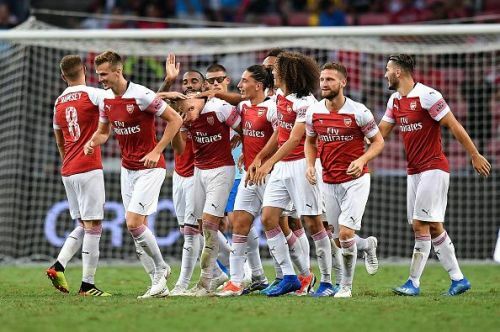 Arsenal travelled to Singapore to take part in the pre-season International Champions Cup. On their flight home, the Gunners would be pleased with what transpired over the course of the two games. In their first game against Atletico Madrid, Arsenal were in control for the majority of the game and conceded a goal from a rare Atletico attack. A few wretched penalties aside, Unai Emery would have been happy with what his troops came up with. Against Paris Saint-Germain, the Gunners were simply magnificent. They made their dominance count by putting 5 goals past a hapless PSG. Slowly but surely, Emery is starting to stamp his identity on the team. The adventure in Singapore has thrown up a lot of positives and has left the Gooners enthused about the season ahead. However, there were a few frailties that were brought to light as well. With the start of the season still a fortnight away, there is ample time for Arsenal to iron out these kinks. Through this article, we look at three things that we learnt from Arsenal’s games against Atletico Madrid and PSG and the implications it might have on the road ahead.